Make a habitat to support small creatures during the winter months. A fun and funky critter hotel can support wildlife in the winter months. Have you ever wondered what happens to all of the insects over the winter? Similar to warm-blooded animals, many cold-blooded creatures seek shelter or migrate long distances in order to survive. 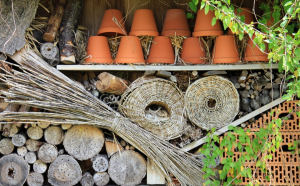 While many gardeners attempt to attract beneficial insects the rest of the year, they often overlook the importance of maintaining an attractive site during the harsh winter months. In our area, the invasive Asian Lady Beetles (Harmonia axyridis) often invades homes, sometimes by the thousands. Once the beetles enter buildings, they seek out crevices in attics or wall cavities, as well as other protected places to spend the season. We also encounter other less delightful creatures such as mice and spiders during this time. Don’t fret; there is good news… By recycling household goods, you can offer these uninvited guests their very own Multi-Habitat Hotel. 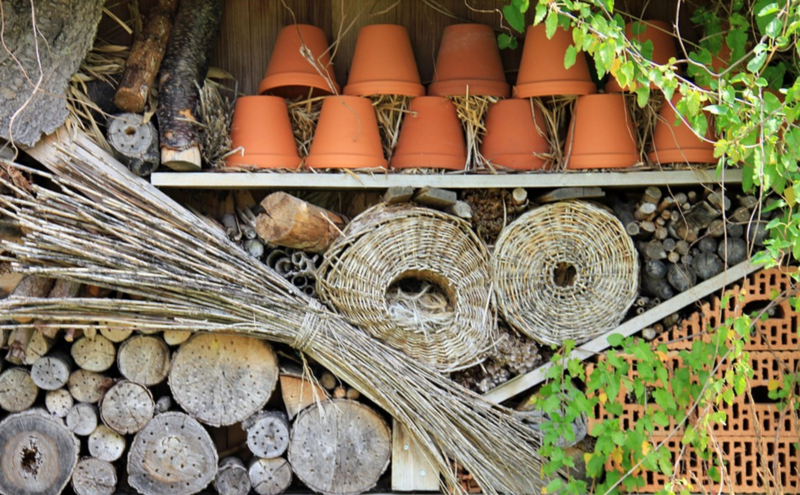 With everyday items such as bricks, old pots, cardboard rolls, wood scrap, twigs, dried flowers, fallen leaves, pinecones and pine needles, you can build a home for a wide-array of animals. You can also assist native bees in the area by drilling holes various sized holes into old logs. Be creative with your reuse, and a few inhabitants will likely stay year-round!